This is my Baby Wolf loom. It's smallish, with a weaving width of only twenty-six inches. 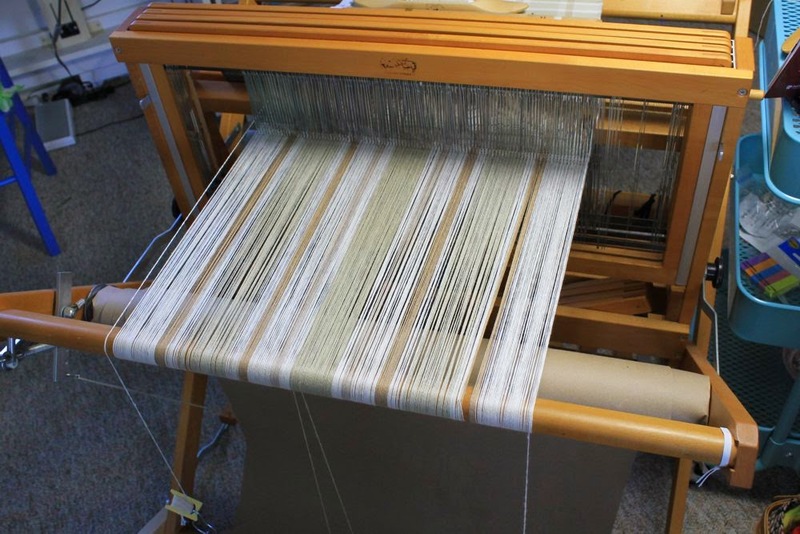 The position of the warp threads, the ones on the loom, are controlled by shafts, frames of wire strands (heddles) through which the warp is threaded. Patterns are decided, in part, by through which heddle and shaft the thread is passed. With only four shafts, I think of this as my starter loom. Right now I have it warped with cotton yarn for dish towels, which will (hopefully) become Christmas gifts. (I've you're on my gift list you might want to look away now.) It's really cool thread, called American Maid (from Lunatic Fringe Yarns), it's totally grown and processed in the US. The colors you see are all naturally occurring, and are supposed to deepen with washing. 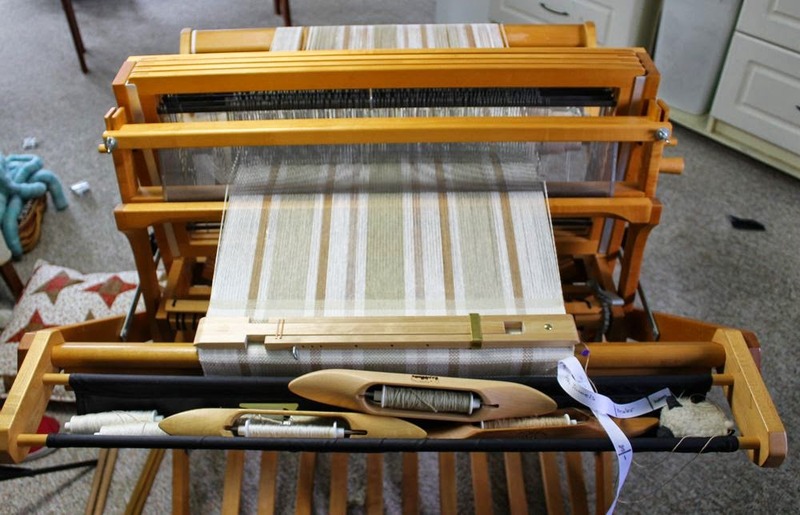 Putting this warp on the loom made me cry. Repeatedly. The thread is so soft that it fuzzed up and matted together as we tried to crank it onto the warp beam. 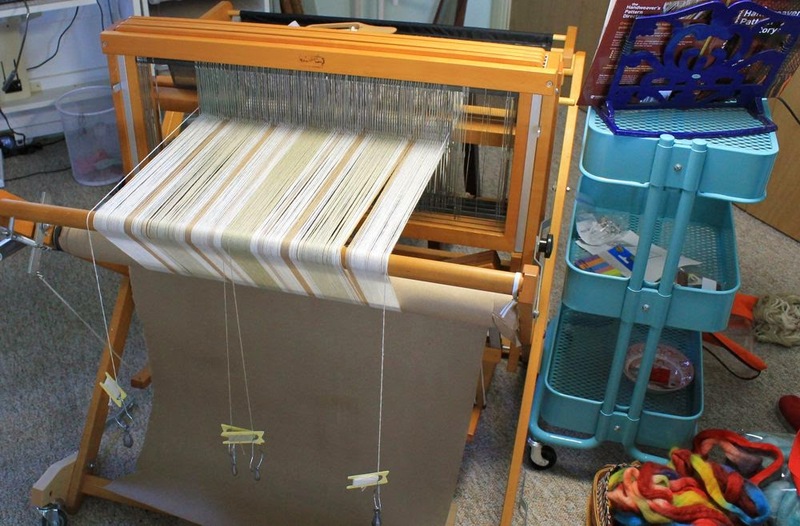 I had wound a fifteen yard warp, hoping to make a whole passel of dishcloths, but we gave up at about ten yards and just whacked the last bit off. Ten yards will still make almost a dozen towels. 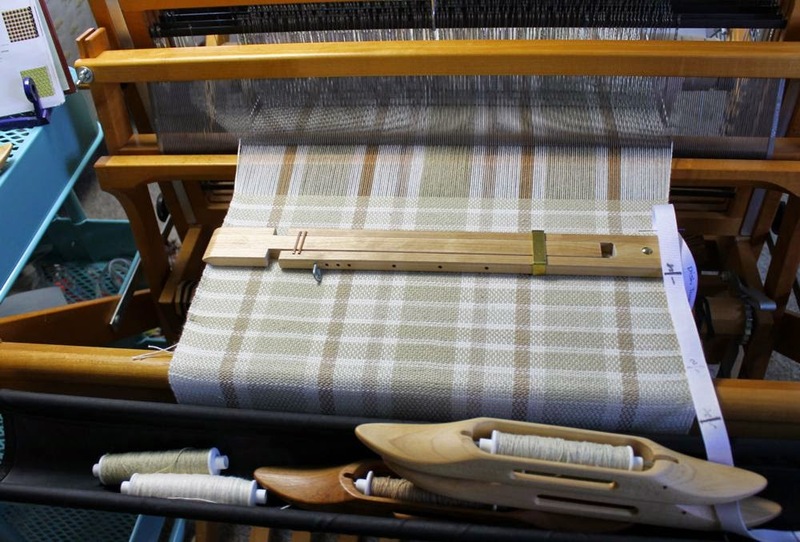 Those threads hanging off the back of the loom are to replace threads that broke in the warping process. The thread is wrapped around a knitting bobbin and a lead fishing sinker is attached with a shower hook to add tension. I'm learning that pretty much everything has a hard part that needs to be done well, and it usually comes early in the process. Babies need birthing, applique needs templates, quilting needs basting, and weaving needs a warp. It takes discipline and patience to get on with the hard parts, the patience part being the hardest for me. I have to admit to developing a new and specialized vocabulary for warping a loom. But then we weave. As I dance on the treadles the shafts pop up and drop down, creating pattern and texture as the shuttles fly by. It is this good part that makes me forget all about the bad part until the next warp comes along. When last we met I was regretting my decision to strip piece these units. Much to my dismay, even though I was feeling pretty smug about how carefully I had pressed them at the time, I found all sorts of pleats in the seam allowances at I put together the blocks. Let's just say there was a whole lot of easing going on. There was also the ongoing question of what the he-heck I was thinking when I designed this quilt to have roughly two billion tiny squares. The color is a little washed out here, but the alternate blocks are all done. Almost all of the teeny-tiny pieces are done. Yeah, right. 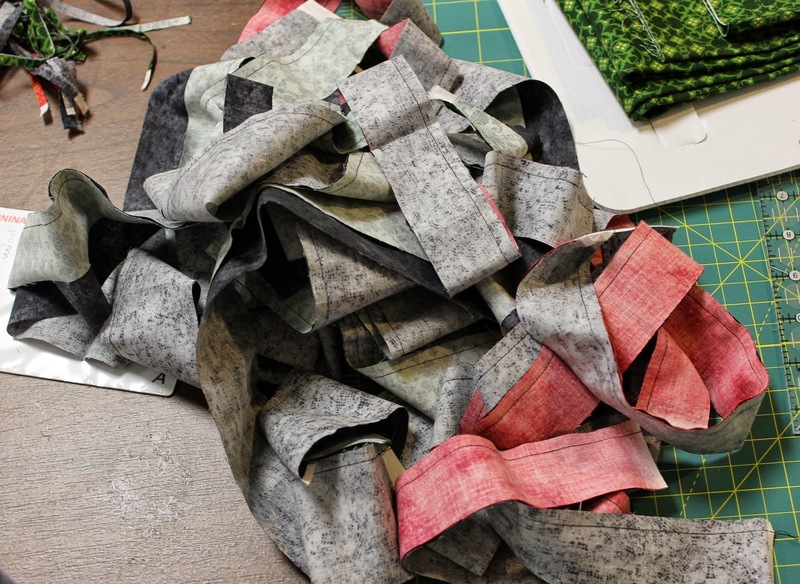 There are also thirty-some sashing strips to be done, and of course, they all contain itty-bitty four-patches. This time I came to my senses and cut first, sewed second. Being able to cut eight squares at a time made short work of it. I've set them up on my ironing pad for what I call "flip-flop pressing". 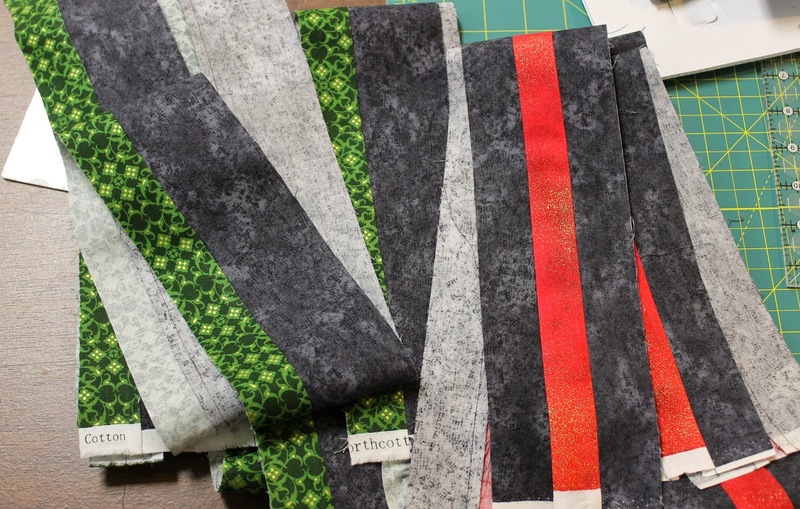 You can sort of see that the green fabric is showing on each of the sewn pairs. 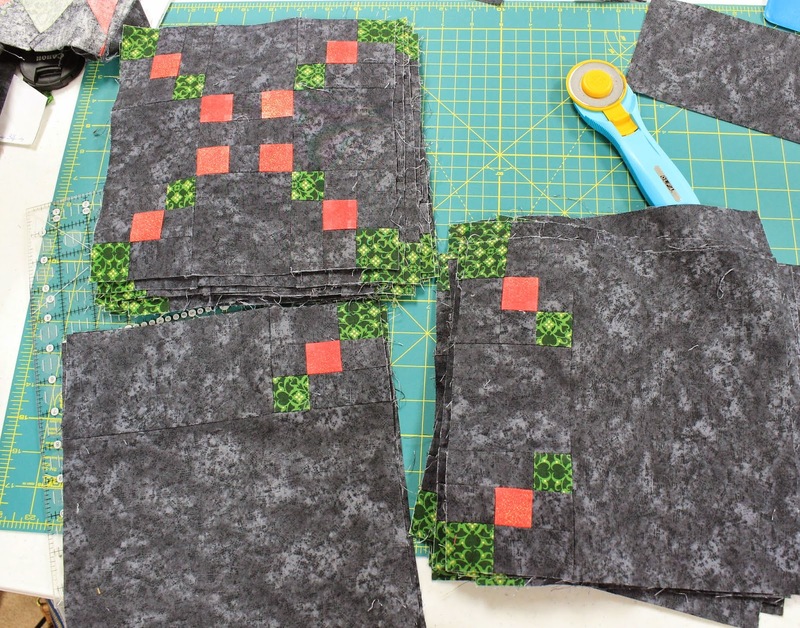 I want these seams to be pressed away from the background fabric, or towards the green fabric. I've alternated the pairs so that the thread within the four-patch will act as my pin for a super tight intersection. Once pressed, the thread was cut between the units, but not within. 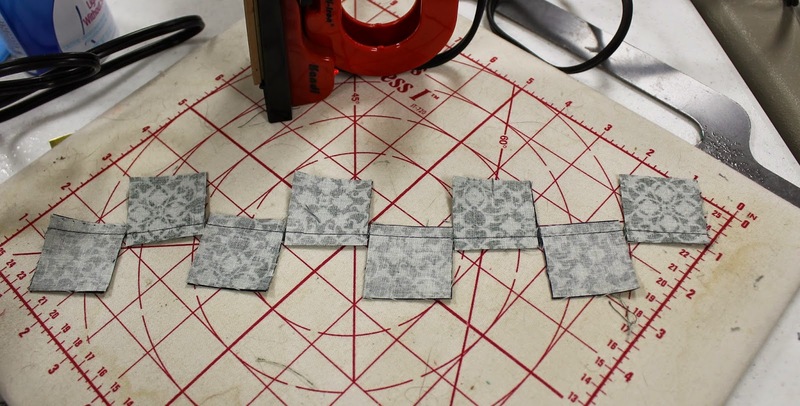 Here they are, set on point with side triangles and ready be added into the sashing strips. It was about this time that I finally figured out that some of my piecing issues were due to a slightly generous seam allowance. I'm working with a machine that is brand new to me, and I can't tell you how long it's been since I've actually sewn anything, so I just figured I was out of practice. 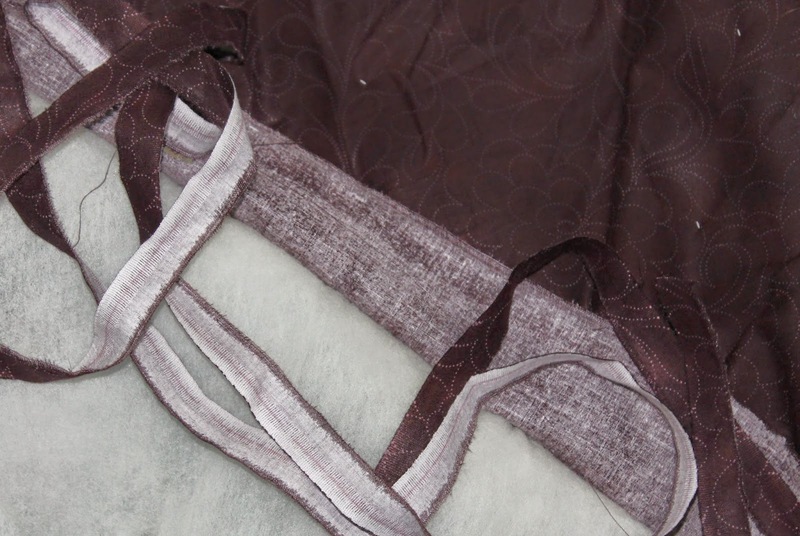 But even when I was paying close attention to positioning the fabric, the seam allowance was still too wide. Moving the needle position one to the right solved the problem. I'm glad I figured that out before heading into the more involved parts of the quilt. This is my "socialization" project. 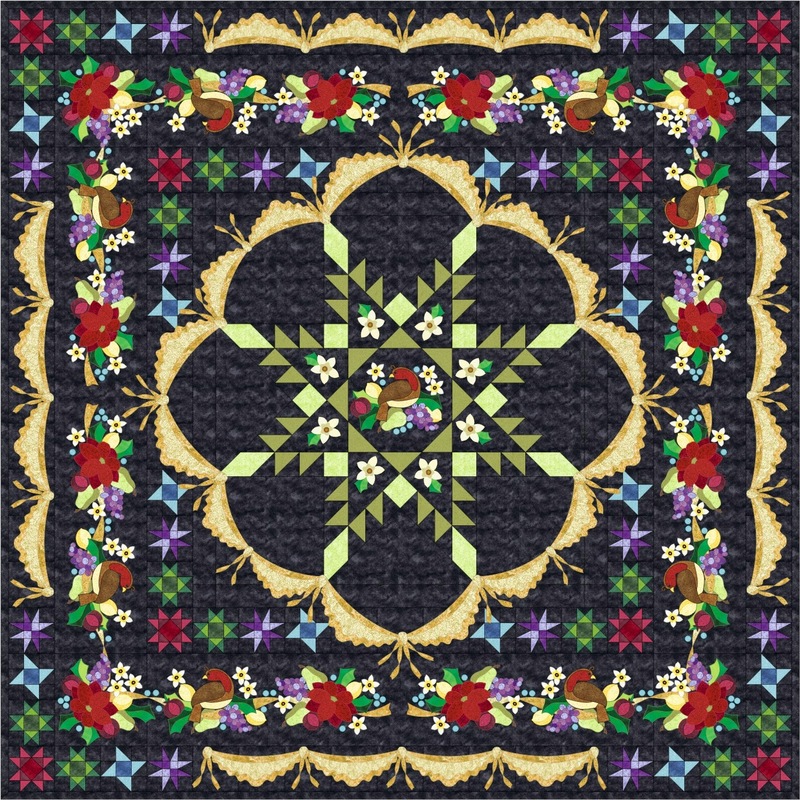 I only work on it at the quilt shop, during Open Sew or Sleep at Home Retreats. I figured I'd be able to knock this quilt in no time at all. About two days into the retreat I was so busy having fun that I forgot about taking pictures, and eventually gave up speedy progress because I was too busy laughing my keister off. Remember this quilt? This is Christmas Yet to Come, the block of the month project for 2011. I loved making this quilt. I loved the over-the-top applique, all simple shapes, but oh, so many of them! It's a large quilt, 102 inches or so square. I knew that basting the quilt could be a challenge. Buying a 108" backing fabric seemed like the way to go. This is also the only quilt that has taken me three tries at basting to get it right. Three tries on a quilt that is 102" square. My first fail came from a rush job at a quilt shop retreat. Because the place was packed full of happy quilters, only a couple tables, of slightly different heights were available. No biggie, right? This is not my first trip to the basting rodeo. Wrong. Puckers and pleats everywhere. Unbasting ensued. 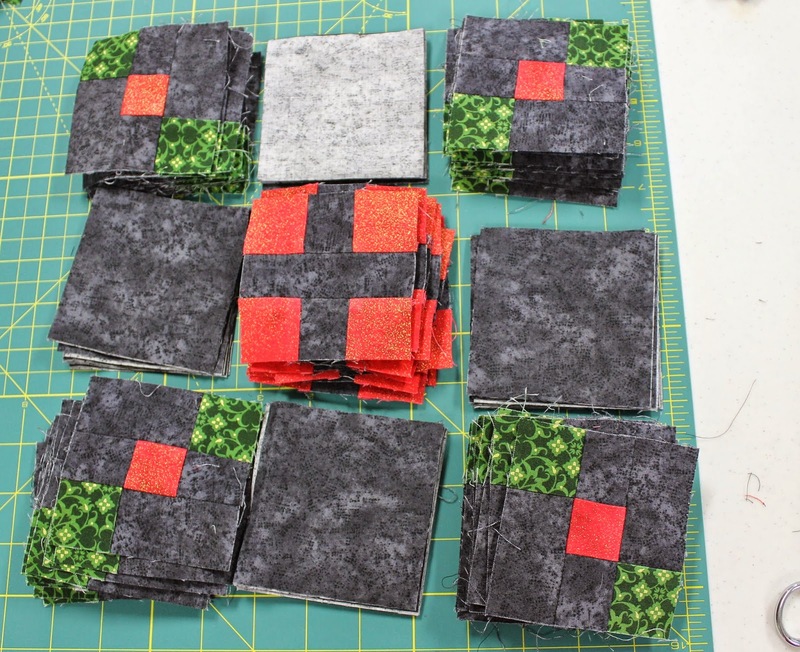 For my second try, I switched over from my default 80/20 batting, which is white, to a black polyester batting that was supposed to be designed for machine quilting. I was concerned about bearding (when the light colored batting comes through the fabric to give it a hazy appearance), and I was hoping the loft of the polyester batt would add to the texture of the quilting. Another epic fail. This time it was incredible static cling that resulted into unruly bubbles on the backing, and the quilt weighed a metric ton. More unbasting. Hoping that the third time would be a charm, I switched out the poly batt for wool. Wool has a gentle loft, and keeps its warmth despite being very light. Of I toddled to the Quilted Cottage, on an off day so that there would be lots of open tables. With all the room I would need, I carefully pressed and then secured the backing fabric to the tables. Starting in one corner, I was careful to leave enough fabric for wiggle room on the edge. I happily basted the majority of the quilt, feeling positive about the outcome this time. But then I came to the opposite side of the quilt. Aaargh! The backing is short by about eight inches. Of course I started by kicking myself in the rear and then sitting down for a little bit of a pity party. I really couldn't face unbasting this quilt yet again. 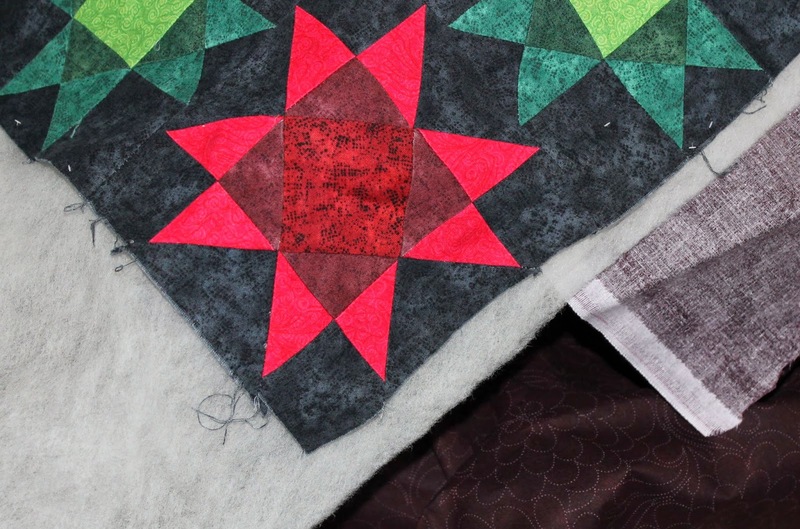 And when I measured out the extra on the opposite end I realized that it wouldn't have been enough, even if I'd snugged the quilt right up to the edges. Perhaps the quilt is a little larger than I thought, or maybe the backing wasn't 108", I bought it three years ago. Maybe it shrank in the closet, lord knows my clothes do. 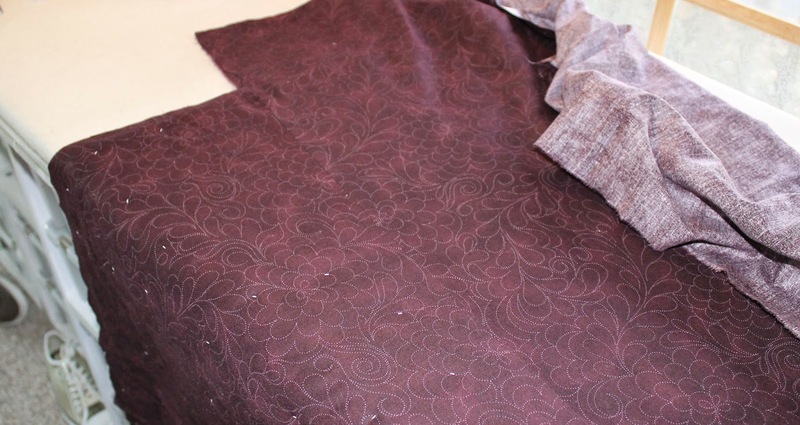 In the end I decided to forge on ahead and seam the backing fabric. I started by ripping away the selvages. I had plenty of fabric left over in yardage, so I ripped that as well. The pieced edge will be cross grain while the majority of the backing is on the straight of grain. This might be an issue if this quilt were to be hung, but I'm not overly worried. I'm going to quilt the snot out of it, so the backing should be very stable. Ripping the fabric keeps the edges perfectly on grain, This might end up being the only "perfect" thing about this quilt. The sewing, even while being very careful, only took a few minutes. My machine has a dual feed option, which helps to prevent shirring along the seam. Otherwise,I would have used a walking foot. A seam this long, and with so much extra weight to one side, is just begging for trouble. The proof is in the pressing. The seam was pressed open to eliminate as much bulk as possible. 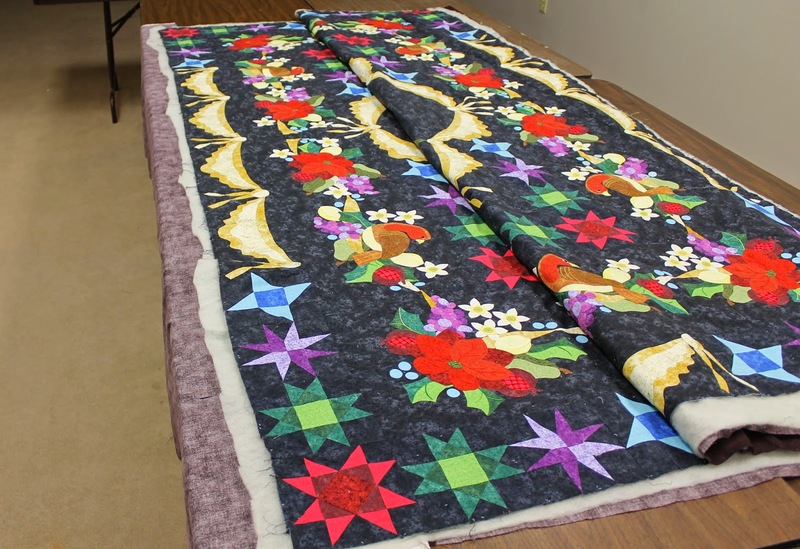 A seam pressed to the side can result in unexpected bumps when quilting. Thanks to the subtle print pattern of the backing fabric, the seam almost disappears. Even though it seemed like a monumental job, it actually took about a half an hour to complete. The quilt is now fully basted. Done and Done. Now it's time to finally commit to a quilting plan. 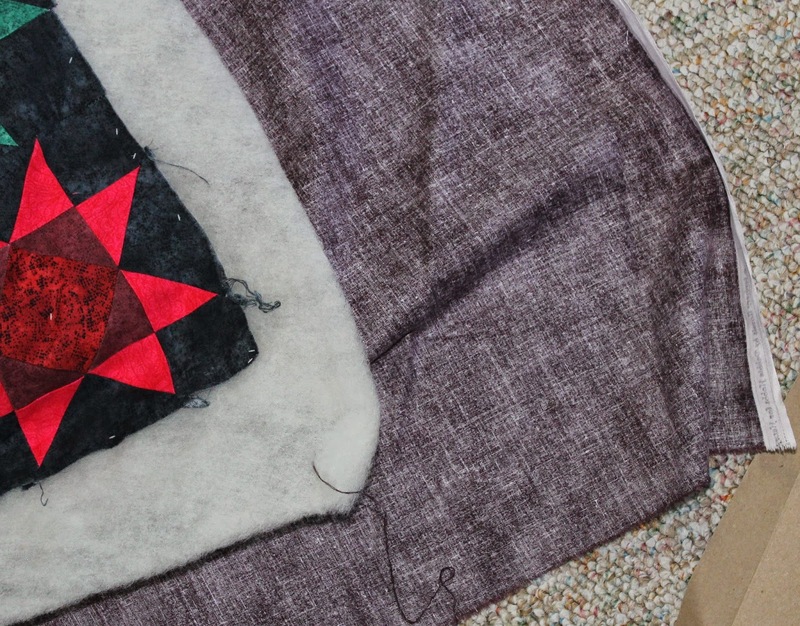 I will begin by stitching in the ditch around the applique and the pieced elements. I'm pretty sure the center stars will be surrounded by some sort of grid work. As for the background fill? I'm open to suggestions. Really. Help! This whole project started because my doctor said I need to socialize more. I am an introvert, and I have plenty of toys to keep me a happy hermit. I had a shocking wake up call when my neck doctor suggested I go with a friend to exercise class, and I couldn't think of one person that I would call. Pathetic, right? Sure, I have friends, but they are all quilting professionals who are spread across the globe. My local quilt shop, the fantastic Quilted Cottage, holds a weekly Open Sew day. No charge, no expectations, just show up, choose a table and set up your quilty nest. This seemed to be the perfect venue for my reentry into civilian quilting life. When I'm working on a new design for possible publication, I start by making a workbook. Since this quilt is all pieced I can work directly from Electric Quilt, printing out rotary cutting directions for each unit of the quilt. EQ does amazing things, but there isn't a single button to push to get piecing directions. For my workbook, I've drawn the units individually. The rotary cutting print out only gives the instructions for cutting one block, and no piecing instructions. 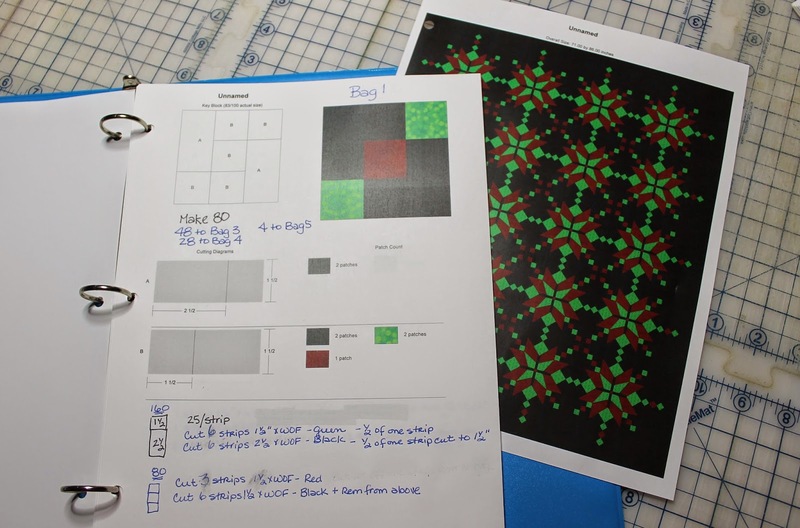 (Bwha-ha-ha, that is why you need me and other pattern designers!) So, I use these print outs to confirm my math and work out the cutting for the required repeats of the unit. 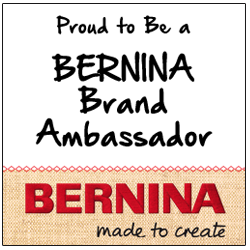 In this case, I need a total of 80 of these little patches. Eighty. 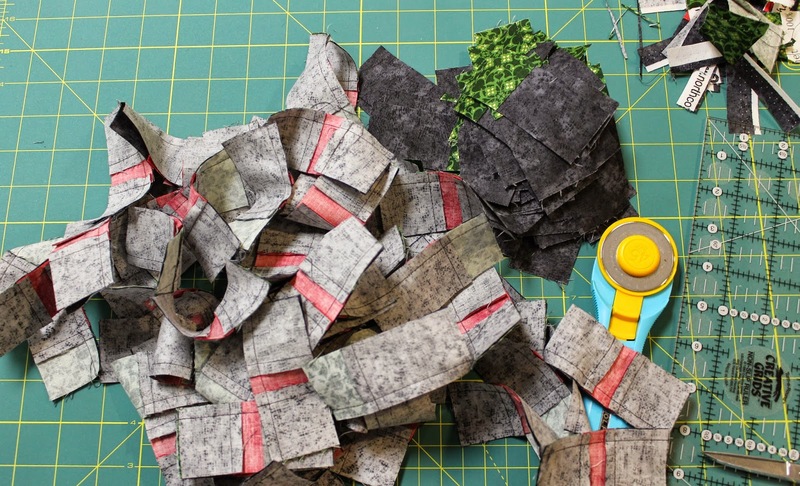 Strip piecing is NOT my favorite. 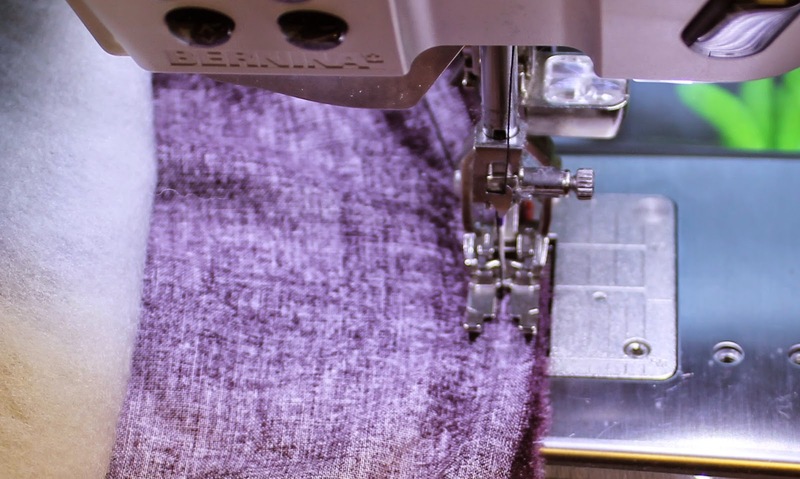 It's just too easy to wander off the seam allowance (forty-five inches is a long way to pay attention), and it's super easy to press pleats into the seams. The Cottage offers lightweight, inexpensive irons for their classrooms (those darned fusers make a mess of them), adding to the challenge of getting a crisp press. I'll be adding my own hefty iron to my travel kit on Open Sew days. But, sometimes, strip piecing is the best way to go, especially for small units such as this. It only finishes to three inches. 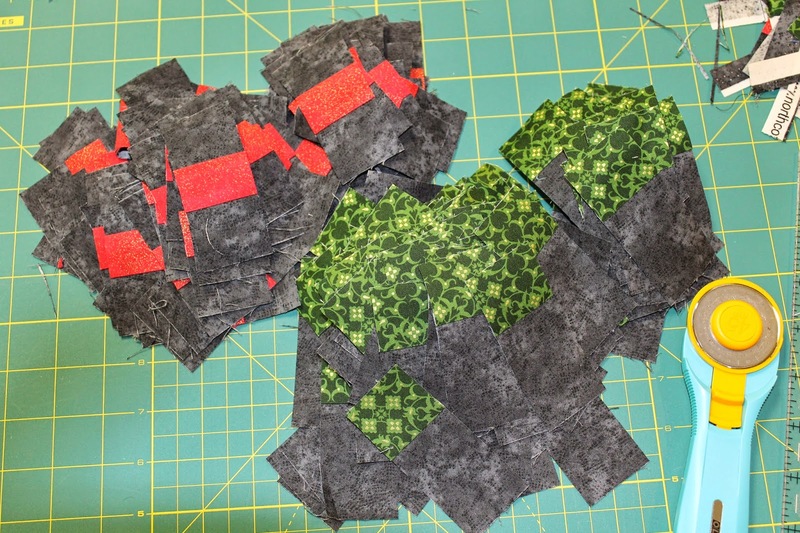 After cutting eleventy-million segments, I'm thinking that maybe strip piecing wasn't the best choice after all. I had to measure and cut each segment individually. If I had cut out all the shapes before sewing, I could have cut multiple layers at once. Plus, it's much easily to maintain that good seam allowance over short seams. And they would have pressed out better. Hmmm. I hate it when I have to tell myself, "I told you so". It's so much more fun to tell it to others. So, I have two thirds of the little unit sewn. It needs another segment sewn on to complete it. They need to be pressed before I go on to the next step, it will be easier to press the seams one at a time. And, I have a decision to make. 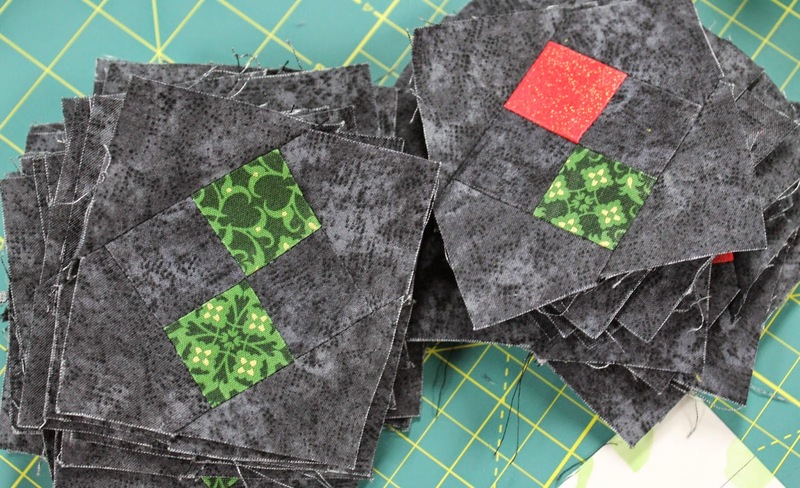 Do I want to clip the seams so that I can press them away from the background (the black) for both the red and green squares? I think I should. I also think it will be a pain. Anyone who has taken a class from me (or my Craftsy class) knows what I nut I am about pressing. You can probably guess what I'll end up doing.